I am sending herewith my German Shepherd JOHN picture for German Shepherd Dog of the Month Contest of October/November of 2013. Kindly requested to acknowledge the receipt of the same for the above purpose. My GSD details and my complete details are given below. Thanking you. Nature : Very lovable , Strong, Energetic and Playful German Shepherd JOHN at Hilltop. He is indeed one handsome fellow. So much so that I thought he at least deserved his own page her on our German Shepherd site as a runner up type award!! I wish you nothing but success and happiness with him in the future. And many, many years of companionship. 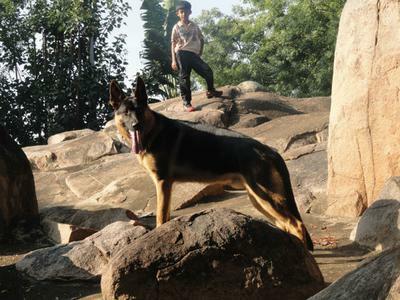 Thanks once again for sending in the wonderful picture of you German Shepherd puppy John. John the GSD is a Handsome male! The picture looks like photo from magazine. Take care of your boy and he will take care of you.